Nightly Ramadhan programs will be held at Imam Ali Masjid from Sunday, June 3rd until Friday, June 15th. 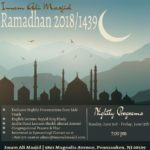 The program will begin promptly at 7pm every night with exclusive nightly presentations from the IAM youth, followed by lectures in English by Sayyid Atiq Ebady, Arabic/Farsi by Sheikh Ahmad Ameeni, and concluding with congregational prayers and iftar. There will also be nightly programs for the youth (ages 5-12) after the English lecture. 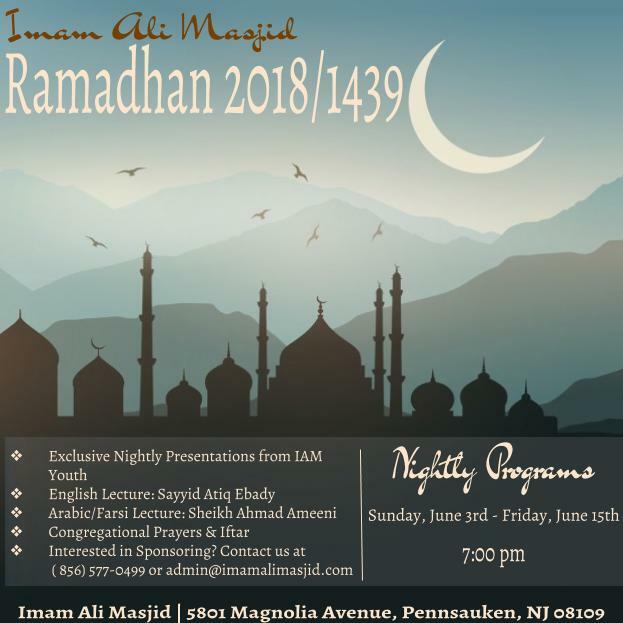 If interested in sponsoring a night, please contact us at admin@imamalimasjid.com or (856)577-0499. View the attached flyer for more information.